Bent Foil Or Chip Hook? Reader Question: Best Book For A N00b Machinist? In theory it looks like a pretty decent idea, and for $12 it doesn’t seem like it’s overpriced. But I’ve spent exactly zero full days on a job site. What say those of you who have? Good idea, or late night TV junk? That might help. But I wonder why it is in North America we don’t have hard hats with a chin-strap? I’ve noticed it seems fairly common when you see, for example, Japanese industrial workers on TV. Their hard hats have a strap. How complicated is that? I’d wear one. I can’t count the number of times my lid has fallen off when I bend over. If I have the adjustment cranked down hard enough to stay on, it becomes really uncomfortable, really quickly. I have to agree with the chin strap comment, as someone who has done a bit of climbing/rigging, climbing helmets are plenty comfortable and stay on well with the chinstrap. I’d definitely consider it for my welding mask…it often pulls hair out at the back of my head when they get stuck in the wheel mech. When I took the “Hard-Hat Tour” at Hoover Dam a number of years ago the hardhats they used had chin straps. They were an ugly baby blue color though so I never wore it again after that but I seem to remember it being a fairly elementary attachment. Perhaps someone could market these along side the band pad. 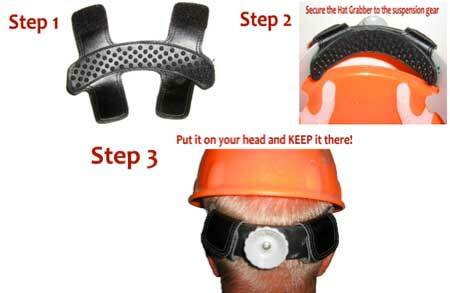 rg, you can get a chinstrap for a hardhat for 2 or 3 bucks. They’re common as dirt. Totally agree with hmbemis. If you crank the wheel hard enough they do stay put. Late to the party, again. My philosophy: light a candle when possible, but that doesn’t mean you have to quit cursing the darkness. The idea that hardhats “fall off when bending” is an excuse I hear all the time. Wearing a hardhat everyday for many years now, I can tell you, if you spend that $12.00 on, say, the MSA V guard that I have, there is no issue as it’s one of the most comfortable cheap hats I’ve used. It stays on no matter what position. this just seems like a solution to a problem that doesn’t really exist. The only time I see that maybe being a real problem is when using hardhat mounted equipment like face shields. You guys are missing the boat sure you can buy a chin strap but who the heck wants to have something rubbing your chin all day long. Especially in 110 degree heat. I tried the chin strap once upon a time. It sucked especially for a guy who has just shaved the night before talk about a long day. And the guys saying you should just crank it down I tried that too that is just asking for a migraine. I think this looks like a pretty good product I think I’ll try one out.